DJI just started shipping their new remote charging station for the Spark. 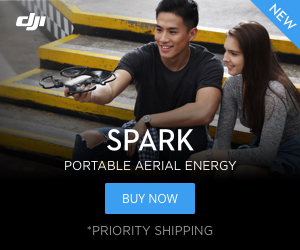 The Spark was already arguably the most portable high-end consumer drone on the market. It is by far the smallest and most portable drone from the world’s biggest drone maker. With folding props but no arms to unfold, the Spark is quick and easy to get up in the air. It is also small enough that nervous parents and small children don’t go running for cover when they see it coming. Until recently the Spark suffered from the same issue that all battery-powered drones do – it needed to be recharged, typically with a wall outlet. No more, the DJI Spark Remote Charging Station has arrived to keep you flying longer while on the road. This cool-looking portable charger is compact and handy. You can get in 6 full flights while you are off the grid if you have three batteries. You don’t even need to pack any wires or USB cables. This slick design securely holds your drone and two spare batteries. If you also get the nice case then you can add your controller and take everything with you safely, securely and in style. Bring everything you see here and you can get 6 flights without access to an outlet. This September I took our Spark to Switzerland but I only had two batteries. I didn’t want to risk missing the perfect flight and I wasn’t sure that two or three batteries would be enough for a half-day hike in the Swiss Alps. What I did to overcome this problem was to buy a backup battery and charge via the USB port on the back of the drone. I will talk about this budget option later in the article, but after experiencing the DJI Spark Portable Charging Station there is no doubt that the charging station is a far superior solution. Too bad I didn’t have it at the time! The Fly More Package got me through a 2-hour hike, but backup power is needed if you don’t want to risk missing the perfect shot. An easy to overlook feature of this case is that it holds and protects the drone much better than existing options from DJI. Not only will it charge your Spark while you are out in the field, it will also keep your prized drone safe and secure. I definitely recommend adding the $19 bag, if you do then you’ve got yourself a compact hard-shell carrying case to go with your charging station. The Spark Portable Charging Station Bag does a good job of storing and protecting the remote. If you are accustomed to the speedy charging time of the 3-up charger that comes with the Spark Fly-More package then you shouldn’t be too disappointed with the charging station. The power output specs of the station are similar the to power brick that it comes with, which is identical to the power brick that comes with the drone. The brick can output 3.83 Amps while the station can deliver 2.2 Amps at the same 13.05 Volts. It takes just over 1.5 hours to charge the station and 3 hours to charge the station and three Spark batteries. When you are on the road it takes 2.5 hours to charge three dead batteries when not connected to an AC power source. Typically, you will pop in a drained battery right at the end of a flight, so rarely will you be charging all three batteries simultaneously. If you start recharging right after a flight then by the time you are done flying with your other two batteries the first battery should be pretty well charged and ready to go. To get the station powered up you’ll use the traditional short press, then long press that you’ll use with all DJI products. The LEDs indicate the charge status of the station and of any batteries that are in it. In contrast, the 3-up charger that comes with the Fly-More package can charge 3 batteries in under 1.5 hours, but that only works when hooked up to an outlet. While I knew the remote charging station was coming, I couldn’t wait to find a portable charging solution when heading to Switzerland. So before I left I bought the 74 Watt-Hour Nektech Power Bank from Amazon for under $30. This backup battery can’t supply the same kind of power that the DJI Charging Station can, it can only deliver 2.4 Amps at 5 volts from the more powerful of its two USB plugs. It does have more energy storage, however, with 74 Watt-hours hours of capacity rather than the 54 of the charging station. While you might get one extra battery charge out of this 3rd party solution, the charging time will be much longer and it is not nearly as convenient. Here is a tip if you are shopping around for a portable backup battery: The maximum size allowed by the FAA for a Lithium-Ion battery is 100 watt-hours. So if you aren’t up for the DJI portable charging station then I recommend you “go big” and get something with over 50 Watt-hours. Check the latest price on our battery bank here. I gave you two portable charging options so you might be wondering which is easier to cart around. As you can see, they are about the same size. What about weight? I measured the Spark Portable Charging Station with the drone and 2 batteries to be 1704 grams (3.76 pounds). This “option A” gets you 6 charges. The bag for the charging station (left) is nice and compact. It has no room for the AC power brick but it does a much better job of protecting the drone and it can charge 3 batteries. To get the same number of flights without the charging station you will need the after-market battery bank. The total weight of option B, which includes the Fly-More package and the backup battery that I mentioned earlier, is 1752 grams (3.86 lbs). Option B is pretty much the same weight as option A. If you are going on vacation you will need to bring your power brick with you and that brings the option A charging station total weight up to 1964 grams (4.33 lb). So the total weight of the battery bank option is less, but as I mentioned before you don’t get all the perks like fast charging, a sturdy bag, and wire-free charging. The DJI Spark charging station will set you back $89. You can get the portable charging solution with two batteries for $139, that’s a great deal. The carrying case will cost another $19. This might seem like a lot but it is really nice to have along. It could be the perfect gift or add-on if you already have a Spark. Did I mention how cool this thing looks too? It would be nice if there was a convenient place to hold the AC power brick in case you are traveling and want to bring it with you. This would make the bag larger and not as convenient for day trips so maybe it’s better they went with the design they have. Some people will be missing the shoulder strap that does not come with the bag but I am not one of them. I will be throwing my hard case with the portable charging station into a backpack or carrying it by hand. Finally, a small pouch for memory cards and a USB cable for charging the remote would have been a nice addition to the bag. All of these minor improvements apply to the bag – the charging station itself is pretty much perfect. Is This the Best Way to Carry Your Spark? In short, yes it is. Not only can you get a solid 6 flights out of your Spark with this charging station, it also does an excellent job of protecting the Spark when you get it with the case. This portable charging solution will charge batteries efficiently and quickly while on the road. Is really is a beautiful bit of engineering. 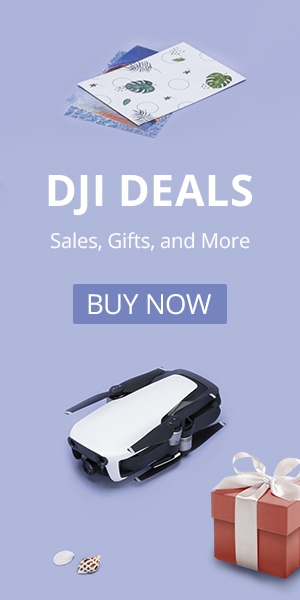 Check for deals and the latest price on DJI.com.